Since last week it has become clear: The rigid Microsoft-Intel partnership is crumbling, and with its ARM processors, Qualcomm will become part of the laptop market in the future. The first notebooks with Snapdragon 835 will come out at the beginning of 2018, promising a long battery life and Always Connected LTE connections to the net. However, many detailed questions still remained unanswered. Here we are providing the ultimate FAQ on frequent questions around Always Connected PCs and the modern ARM variant of Windows 10. 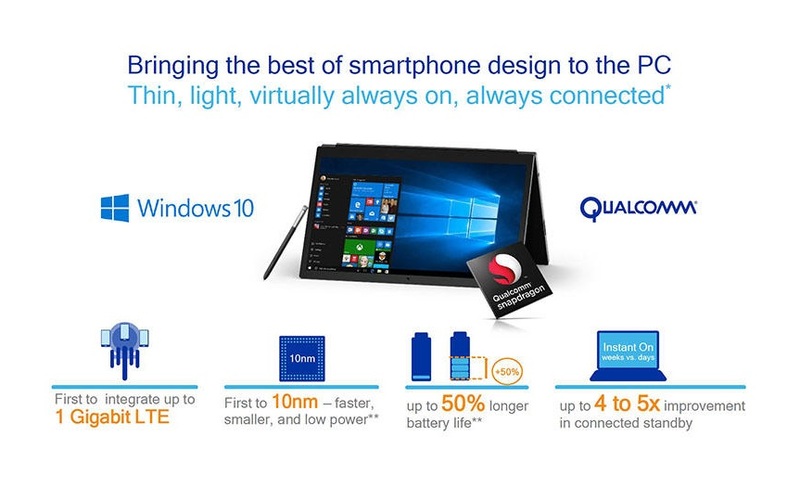 Even though many questions remained unanswered at the Qualcomm Tech Summit in sunny Hawaii, the new possibilities and limitation of the Always Connected PCs with Windows 10 and its ARM emulation are gradually becoming clearer. From the diverse information available, we have summarized the most important questions and answers for you in FAQ format. Can all 32-bit applications run on the Snapdragon laptops? In principle, yes, as long as you have updated from Windows 10 S to the Pro version. However, this does not include applications that use Kernel mode drivers, such as the standard antivirus programs or games with anti-cheat software. No, not at this point. However, developers can recompile their applications for ARM. If this new type of device is successful, this will happen more and more in all likelihood. Can only Windows 10 S run on the Always Connected PCs? No, Windows 10 Home, Pro, or Enterprise will work as well. However, you will need the next Windows 10 update (Redstone 4), which is supposed to be completed by March 2018 and so before the new devices become available. For how long will the free update from Windows 10 S to Windows 10 Pro be available? For all the buyers of a Windows PC with a Snapdragon SoC, the update is supposed to be free until September 2018 at least. Whether this offer will be extended is not currently known. Do all Always Connected PCs have to be delivered with Windows 10 S? No, this is not a prerequisite. However, Microsoft is probably trying to bring the version which is limited to Windows Store apps to a wider audience, and it is cheaper. What can we expect from the Always Connected feature that the current notebooks with LTE connections cannot do? 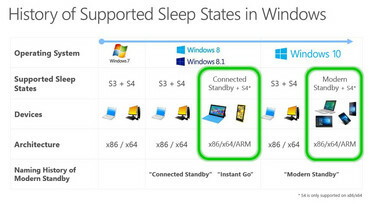 This power management function, which was also called "Always On" or "Connected Standby" in the past and is now also called "Modern Standby," offers more typical smartphone features such as the immediate availability of the PC, even if it is slumbering in standby mode. If a SIM card is installed with an available data package, the PC can, for example, receive notifications when it is turned off in standby state, and then display them right after opening the display lid. The need to shut down and reboot the PC should become the exception instead of the rule. However, this feature is not only available for the new laptops with the ARM SoC, but also for modern notebooks or convertibles with Intel or AMD processors, if the manufacturer supports it (see images below). Why is the next Windows Redstone 4 update a prerequisite? The next Windows version is supposed to bring further improved power management features, which generally prolong the battery life of notebooks. For Always Connected laptops in particular, there will also be improvements in the LTE connectivity. The first notebooks with the Snapdragon 835, such as the Asus NovaGo, already offer an e-SIM in addition to the regular SIM slot. Redstone 4 will allow the user to install e-SIM profiles and with that also data packages through the cloud (probably the Windows Store). 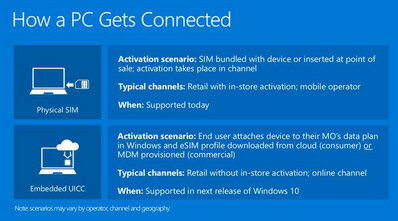 ... which are a prerequisite in particular for Always Connected PCs. 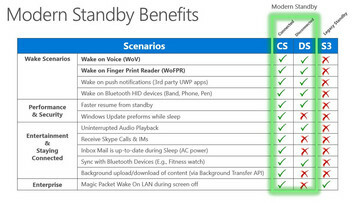 Modern Standby is the prerequisite for the Always-On feature. But the new standby modes are not limited to ARM laptops. Is the integrated Snapdragon 835 processor the same as that in the 2017 smartphones? No, this is a new revision which has been optimized for PCs. It runs at up to 2.6 GHz (at least in the Asus NovaGo) instead of the 2.45 GHz maximum and offers a slightly different WLAN support (no 802.11ad) but not WiPower or Quick Charge 4. In any case, the X16 modem with LTE download speeds of up to 1 Gbps is integrated. Why do the new Always-Connected PCs not already start with the Snapdragon 845, which was introduced last week? This is due to the development periods in the PC sector, which are different and slightly longer than in the smartphone market. Microsoft started the cooperation with Qualcomm before the Snapdragon 845 was completed. Will the Snapdragon 845 also be available in future PCs? If so, when? Yes, the Snapdragon 845 should be available in the second wave of the Always Connected PCs. It is not currently known as to when they will be available in the market, but it should be by fall of 2018, possibly for the IFA 2018, but this is speculation. According to Paul Thurrott, the development times will become more synchronized between the snapdragon phones and PCs in the future. Will there also be desktop PCs with Snapdragon SoCs? While currently there are no plans for this, in the future there should also be other mobile form factors than notebooks and convertibles. There should be some new announcements on this at CES at the beginning of January 2018 and the Mobile World Congress 2018 at the end of February. Besides the Asus NovaGo and the HP Envy X2, which other notebooks will be available? There are currently no concrete announcements yet, but besides Asus and HP, also Lenovo, Dell, and the smartphone specialists Xiaomi and Huawei might probably work on the corresponding designs. The latter have already done some excursions into the notebook world. Possibly, we will also hear some news on this at CES and the MWC. 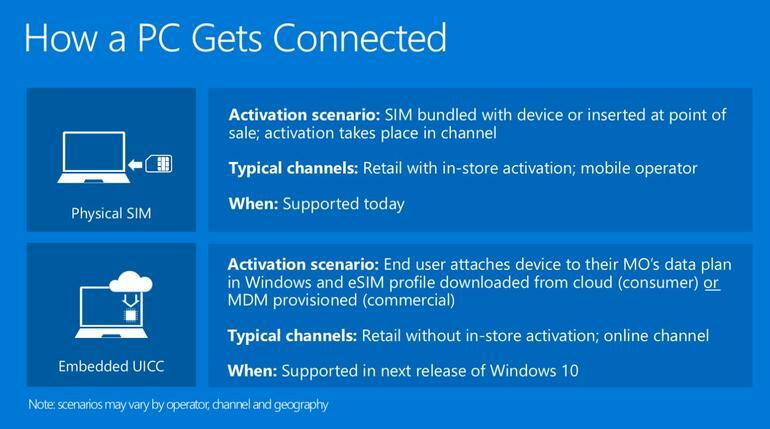 Will there also be Surface devices from Microsoft with a Snapdragon SoC? Until now, this is speculation. However, it is possible that the foldable Andromeda phone, also known as Surface Phone, which has been showing up in patents and rumors in the last few months might be equipped with a Snapdragon SoC. As a cross between a smartphone and tablet, this might be a likely candidate at least. It is not currently known whether Microsoft is also working on regular Surface tablets with a Snapdragon SoC. When will the new snapdragon notebooks be available in the market? Asus plans to deliver its NovaGo convertible, which has already been briefly shown in a Hands-On, by the end of March of 2018, including in some European countries such as Germany. HP has generally specified the availability of the Envy X2 during the spring of 2018. As already mentioned above, there should be no laptop with a snapdragon processor before the final Redstone 4 Windows version becomes available on the market. Probably most of the devices will become widely available in the second quarter of 2018 and thereafter. Microsoft partners for the Always Connected PC initiative. How realistic is the specified battery life of 20+ hours? Even though it is still too early for the final test results, some analysts who have already had access to earlier device versions report that the specified 20 to 22 hours are quite realistic. Ryan Shrout, an analyst with Shrout Research, and Patrick Moorhead from Moor Insights & Strategy said at the Qualcomm Tech Summit that even though they are skeptical of the manufacturer's specifications of the battery life, in everyday work with earlier versions of the device which did not have the final software yet, they achieved quite similar values. (In the Podcast from minute 6:17). Ultrabook Review already had an early test sample of the Asus NovaGo in their limited test, but it was unable to fully achieve the specified values and only achieved between 7 and 15 hours on average with one charge, depending on the application (multitasking or playing videos). However, we should mention here that the efficient standby mode was apparently not working then, so we should wait with our verdict until the final devices and Windows version have become available. What performance can you expect from the notebooks and convertibles with a Snapdragon SoC? Based on early benchmark results of the Asus NovaGo, we are preparing our own report, which will be linked here as soon as it goes online. Even in these benchmarks, we have to consider that the notebooks are in their early testing phase, and take the non-optimized benchmark software into account. We can generally say that at least the Asus NovaGo will be more of a competitor for an Intel notebook with a Core M3 processor, so it will be a good alternative to the Atom technology from Intel and perhaps even to the more affordable representatives of the Core Y processors. Paul Thurrott also classifies the new device types with quiet and slim form factors at about the same level as the Core M3 Intel processors and states that this is exactly the level that is needed by the majority of consumers in their everyday life. Are the Always Connected PCs worthwhile in terms of their price-performance ratio? A general verdict on this is not possible yet. But we can already see that the Asus NovaGo model with 4 GB of RAM and 64 GB of storage for about $600 might probably suffer from a lack of storage and RAM, particularly after the upgrade to Windows 10 Pro. At $800, the model with 8 GB of RAM and 256 GB of storage is already in the price range where there are many Intel alternatives with probably a much better performance in the regular notebook market. As long as battery life, the LTE connection, and a fanless and slim case are the most important criteria for an everyday companion, the Snapdragon competition might be the better choice, even in its first generation, but everyone else might be better served with an Intel device for now. However, this can probably be judged individually after the final hardware becomes available. 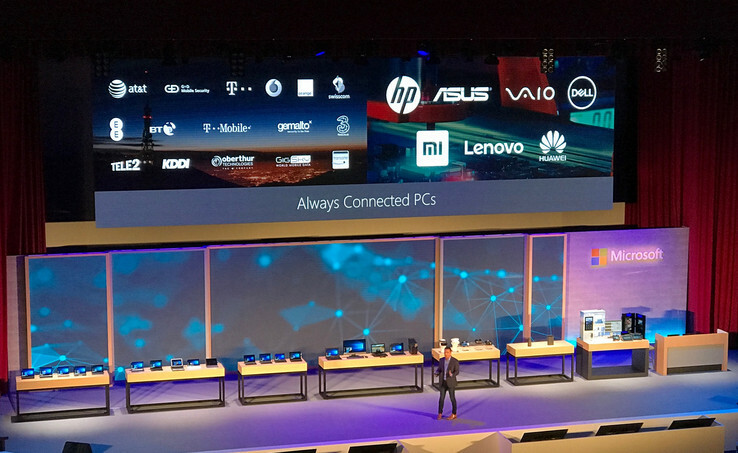 Does the new Microsoft-Qualcomm partnership have any opportunities for the future at all? 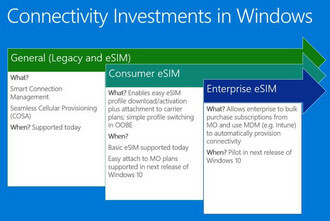 The experienced Windows specialist Paul Thurrott even sees the Always Connected PC as the future of the Windows platform. 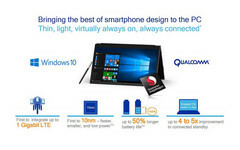 While he admits that the first generation of the Snapdragon PCs in particular cannot keep up with the established Intel laptops in terms of performance and features, considering the shrinking PC market and the shift towards smartphones and IoT devices, he sees a rosy future for the Always Connected PC category, since it enables a lot of those features that the younger generation are used to from their smartphones. He does not see the fact that due to their lower performance, the devices are less suited for applications such as gaming or rendering as a problem. He sees the cultural shift brought about by the rise of mobile gadgets and the slow decline of PCs as a chance for the new device class and as an opportunity for Microsoft to compete with iPads and Chromebooks. By the way, in the future Intel and AMD will also pay more attention to Always Connected features and longer battery life in the PC sector. So the Qualcomm competition might have a beneficial effect on the established platform as well.